At Brahms Mount, we love a beautiful finished edge, and a lot of the time that means with fringe! Many of our fringe details are hand-twisted and knotted. Here are just a few of our favorites. This throw is one of our favorites: featuring a modern large-scale herringbone pattern and available in a variety of colors, the Cotton Herringbone Throw is finished off with the hand-twisted and knotted rope fringe. This comfortable and soft cotton throw is machine washable and colorfast, so you'll never have to worry. 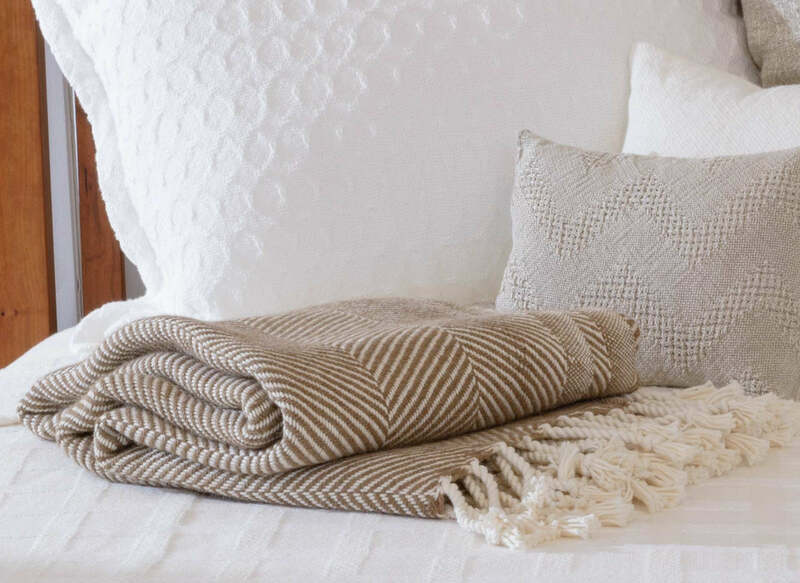 Click here to learn more about the cotton herringbone throw. Inspired by French lace and tickings, this linen throw comes finished with a 1.5" fringe on two sides and hem on the other two sides. This throw is perfect for staying cool in the hot summer months. 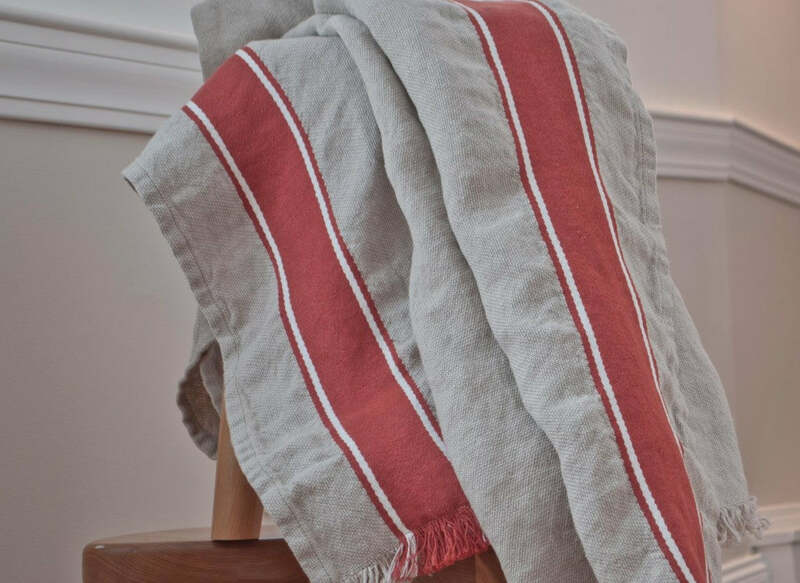 Click here to learn more about the madder red featherstripe throw. Another cotton throw finished with our iconic hand-knotted fringe, this tight twill weave and two wide border stripes is a neutral that will match nearly any design style or color palette. You'll love the comfort of cotton, as well as the colorfast and machine washable nature of this beautiful throw. Click here to learn more about the cotton throw border twill. 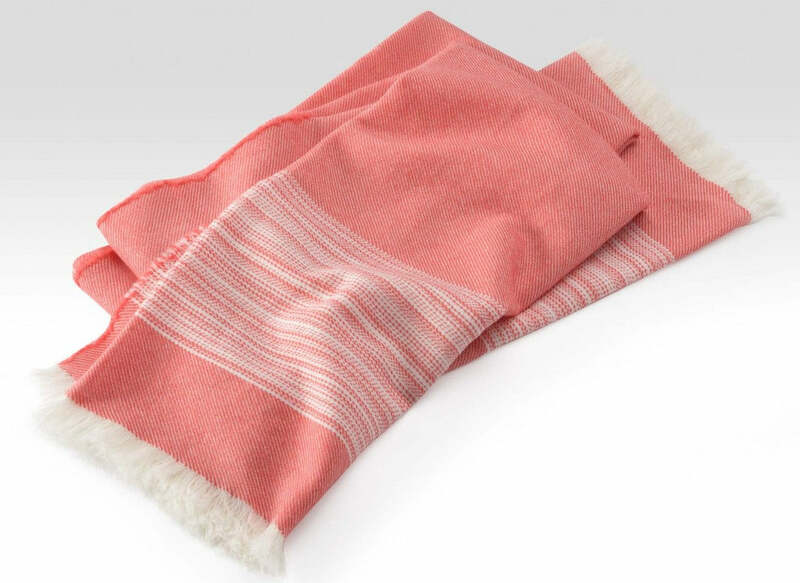 You'll love the smooth and lightweight feel of this fine micron throw just as much as we do. Finished with a beautiful fringe at each end, this throw is available in a variety of bright, vibrant colors. Similar to the Wool Wrap Saturn Stripe, this throw differs in its design. The trendy ombre look will give your room a ton of interest. Finished with our hand-knotted fringe, this micron wool blend will keep you warm and cozy all year long. Click here to learn more about the wool ombre throw. 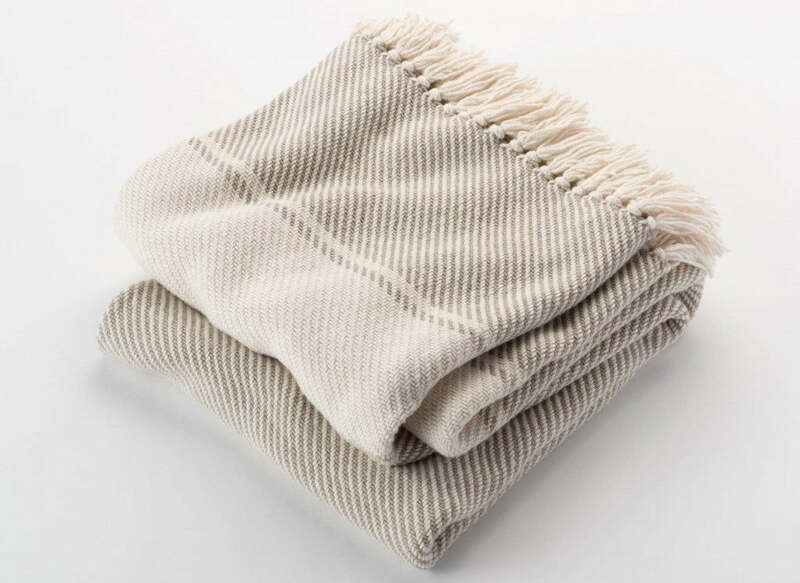 A similar style and design as the Cotton Herringbone Throw, this throw adds a touch of luxury with the Alpaca blend. Alpaca’s long, hollow fibers trap air and naturally regulate body temperature, while cotton enhances the softness and warmth. Finished with our hand-knotted fringe, this throw will leave you loving blends. Click here to learn more about the cotton/alpaca herringbone throw.